Grieving residents of Paradise, California, are looking to the future as they experience the love of God’s people. The deadliest wildfire in California history, the “Camp Fire,” roared through Butte County and the town of Paradise in early November. The fire destroyed more than 14,000 homes and over 150,000 acres in this area of northern California. At least 85 people died. Harrowing stories of escape and tragedy still bring people to tears, but God is writing a new story in the midst of these difficult weeks and months. A Samaritan’s Purse volunteer recovers precious keepsakes from the ashes of a home in Paradise, California. 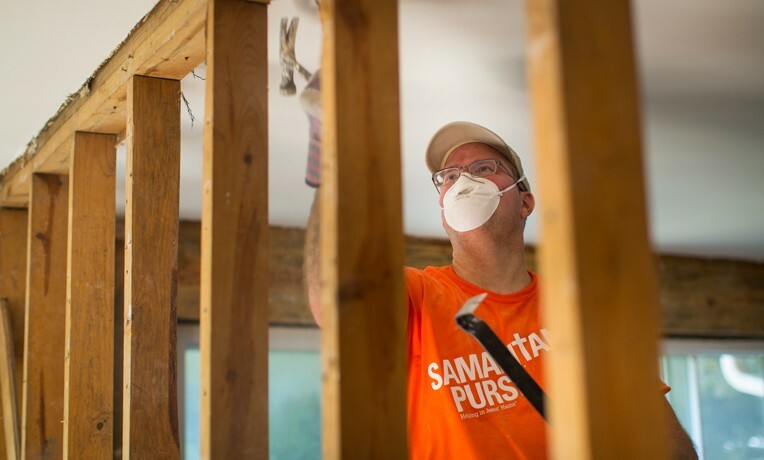 Samaritan’s Purse volunteers have been responding to hurting communities since the fires were contained in late November. Coming alongside these grieving residents in Jesus’ Name, our teams are helping them sift through the ashes and salvage valuables and keepsakes not destroyed by the fire. During a recent visit to affected areas, Samaritan’s Purse president Franklin Graham surveyed the destructive path of the fire. Local churches also have been faithfully serving their communities in Paradise, Chico, and other areas. A number of members of Paradise Alliance Church, our base of operations, have served with our volunteer teams—even though they’re recovering from their own losses. If you’re interested in volunteering, see our opportunities listed here.